A portion of the beltway will be closed next week for paving work. The Maryland Transportation Authority says that all lanes of eastbound I-695 (inner loop) at I-95 (Exit 33) will be closed. Traffic will be detoured to northbound I-95 (Exit 33), to eastbound MD 43 (Exit 67, White Marsh Boulevard), to eastbound MD 7, to westbound MD 43, to southbound I-95, to eastbound I-695 (Exit 64). 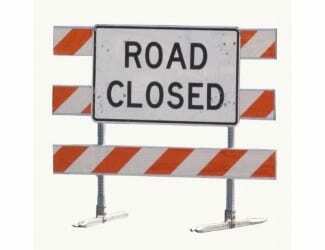 All lanes of westbound I-695 (outer loop) at I-95 (Exit 33) will be closed. Traffic will be detoured to northbound I-95 (Exit 33), to eastbound MD 43 (Exit 67, White Marsh Boulevard), to eastbound MD 7, to westbound MD 43, to southbound I-95, to westbound I-695 (Exit 64). Weather permitting, all lanes of eastbound I-695 (inner loop) will be closed Monday, Nov. 14, and Tuesday, Nov. 15, from 10 p.m. to 5 a.m. the following morning. Weather permitting, all lanes of westbound I-695 (outer loop) will be closed Wednesday, Nov. 16, and Thursday, Nov. 17, from 10 p.m. to 5 a.m. the following morning. Crews will be paving the roadway as part of the Maryland Transportation Authority’s (MDTA) I-95 Improvement Project with Express Toll Lanes (ETL). The current work at the I-95/I-695 interchange will reconstruct and realign I-695 from US 1 to MD 7 (Philadelphia Road). The project is anticipated to be complete in fall 2016.